During a Q&A event in Moscow with Russian President Vladimir Putin, NSA whistleblower Edward Snowden asked if Russia engages in the same type of mass surveillance as the NSA. 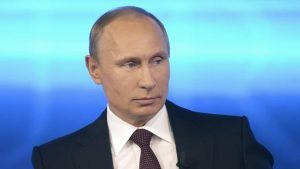 Putin responded by stating that it only monitors individuals after a court has provided permission to do so and therefore, “dragnet” surveillance is not permitted in the country. This sort of monitoring is significantly different than what the NSA is involved with, as Snowden has revealed that the US spy agency collects data from millions of people, many of whom are not suspected of anything. Of course, US officials denied the mass surveillance programs early on, so we cannot take Putin’s word for it either. Though if Russia was engaged in a widespread monitoring program like the US, it is likely that some information regarding it would have leaked at this point. Russia provided asylum for Snowden last year, after his plane landed in the country and was unable to continue further. From what we know, it was now Snowden’s plan to stay in Russia and even now, he is looking for a more permanent location, since he is technically “on the run” from the United States. Snowden was not physically present to ask his question but rather he submitted it prior to the event through “secure” means. Russia and the US have a very strange relationship at times and while some would expect Putin to outright criticize the United States and the NSA, he has not done so. Instead, Putin has stated that fighting terrorism is necessary and he agrees that terrorists and other criminals use the internet to communicate. However, based upon the President’s answer to Snowden, it seems like Putin doesn’t agree with the methods that the NSA uses. Question – Do you believe that Russia doesn’t have the same sort of mass surveillance program? Summary: Edward Snowden asked Vladimir Putin if Russia has a mass surveillance program like the NSA’s. Putin said that it doesn’t because a court must provide permission to monitor the communications of individuals.